The versatility of the DTC4500 is unsurpassed from loyalty cards to sophisticated access cards with embedded electronics. Empowered by an extremely robust and highly-reliable print engine, this high-volume printer delivers speed, power and versatility rolled into one. DTC4500, Double-sided Base Model USB and Ethernet, 2 Year Warranty. This is a Zebra printer repair part. DTC4500, Single-sided field-upgradable lamination module. 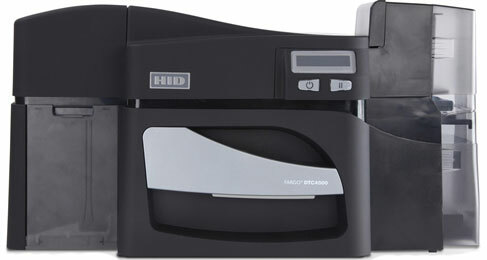 Includes double-sided printing module. DTC4500, Card Printer-Encoder (LC /Double-sided/Double-sided LAM/MAG/IClass/MIFARE/Desfire/Contact Encoder). This is a Zebra printer repair part. Ribbon, YMCKOK: Full-color ribbon with two resin black panels and clear overlay panel - 500 images. Compatible with DTC4500, DTC4500e. This part is also known as 045210. Ribbon, Full Color (YMCKK) Ribbon, 500 images. The ribbon is used to print in a variety of colors: yellow (Y), magenta (M), cyan (C), and black (K) on the front of the card. The second (K) allows for black print on the back of the card. This ribbon is used to print text and full color images on one side and black on the back side of the card. Compatible with DTC4500, DTC4500e. This part is also known as 045215. 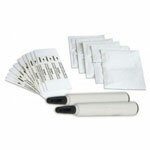 Ribbon, Standard Black (K) Cartridge, 3000 images per roll. The ribbon is used to print in one monochrome color: black. This ribbon is used to print text and one-color images one or both sides of the card. Compatible with DTC4500, DTC4500e. This part is also known as 045202. 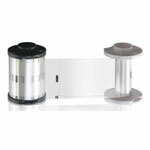 Ribbon, Premium Black (K) Cartridge, 3000 images per roll. The ribbon is used to print in one monochrome color: black. This ribbon is used to print text and one-color images one or both sides of the card. Compatible with DTC4500, DTC4500e. This part is also known as 045201.